Print Preview is used to display the current document as it would appear when printed. The main difference between the Print Preview window and the document as it is shown in Jarte's editing pane is that the Print Preview window shows the page margins and the header and footer lines, if those are defined. 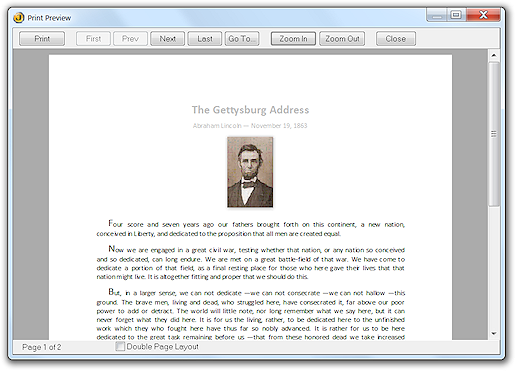 The Print Preview window contains controls for navigating the document's pages and for zooming (i.e., magnifying) the document. The Double Page Layout check box at the bottom of the Print Preview window is used to show two pages at once in the Print Preview window. The Print Preview window also contains a Print button which can be used to print the current document directly from the Print Preview window.